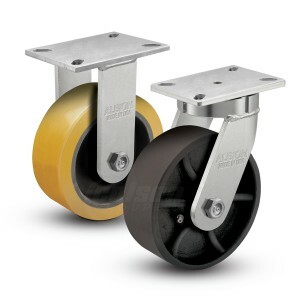 Albion 410 Series casters are constructed from high quality, heat-treated AISI 1045 laser-cut steel. Precision-machined kingpinless swivel raceways and fully welded legs (inside and out) deliver superior strength in rugged applications. Explore Albion 310 Series for different top plate sizes and caster capacities.